I’m offering my talent as Caricaturist, Cartoonist and Illustrator in general. Not only will you find me to be a very creative person, I am a very patience and easygoing person as well, who will team up with you to produce a final product what will delight you. I don’t have a big ego, so I don’t come with any attitudes. The foundation of a great final product is communication … so let’s talk! Portraits:Portraits can be done digitally, or I can prepare an oil painting on canvas, markers on paper, charcoal on paper, etc. (Please read ‘Technique and Materials’ at the bottom of this page for more information.) I respect the likeness of the person and don’t overly exaggerate any feature. Caricature: It is a graphic representation of a person, but with some exaggerated features. Likeness will be present and recognizable as well. I do flattering caricatures, with the level of exaggeration guided by the client. The idea is to make everybody happy and never to offend anyone. Some common exaggerations are a big head with a little body or a person placed in a funny situation suggested by the client. Caricatures are typically done digitally or with markers on paper. Other techniques are available by request. (Please read ‘Technique and Materials’ at the bottom of this page for more information.) If you want more information or you have any questions about this service, please send me a message through the 'Request Service' form. 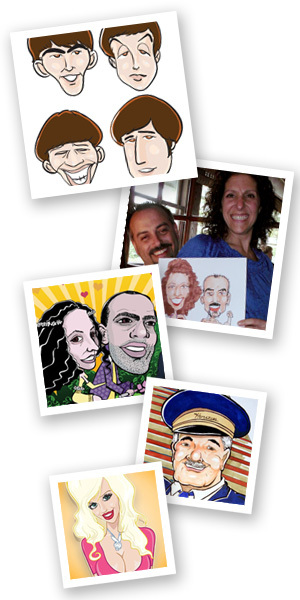 I also offer a live entertainment service, creating caricatures at private parties or corporate events. For more information about this service, visit ‘Parties’or click here. Illustrations in General: With an extensive artistic background, I am able to do just about anything. If you have a project in mind that I haven’t listed on my website (like a sign, a billboard, etc.) please feel free to contact me and let me know what you have in mind. I will be happy to give you a free consultation, and together we will see what the best option is for you. Please send me a message through the 'Request Service' form. Live Caricaturist at your Private Party or Corporate Event:This is a fantastic way to make your event unforgettable and fun! Entertain your guests with a live caricaturist! An artist on hand to do spontaneous caricatures is a fantastic way to keep both young and mature (but young at heart) guests entertained. I’ll bring a French easel, special paper, and makers; and, your guests will get a party favor that will last forever. I cater private parties, birthdays, weddings, sweet sixteen parties, Communions, Bar Mitzvahs/Bat Mitzvahs, etc. I also attend corporate events. Animation: If you are looking for an animator to make your script a reality, I’m your guy! I have experience doing cartoon animations and video editing. I mix arts and technology to achieve a clear and fun message to give to your current clients and/or attract new customers. If you want more information or you have some questions about this service, please send me a message through the 'Request Service' form. - Tangible Artwork: Like a marker caricature, an ink illustration, an oil painting portrait. Portraits, Caricatures and Illustrations in general are given in a 11 x 14 inches (27.9 x 35.6 cm). Most of the time the technique used is markers. I also offer illustrations in black ink only. Other colorig options are available per request. I also offer Portraits painted on Canvas (20 x 24 inches / 50.8 x 61 cm). Other sizes are available per request. - Digital Artwork: Like a mascot design, a digital illustration, etc. This type of work is given to the client by email or in a DVD. All digital illustrations are given in vector format and bitmap. Bitmap: The BMP File Format, also known as Bitmap Image File or Device Independent Bitmap (DIB) file format or simply a Bitmap, is a Raster graphics image file format used to store bitmap digital images, independently of the display device (such as a graphics adapter), especially on Microsoft Windows and OS/2 operating systems. Vector vs Bitmap: Any vector file can be printed in any size possible; From a very small print to a gigantic format. Is also ideal for logotype, Offset Print, etc.